that league's All-Star Game in 1979.
most exciting series ever played. 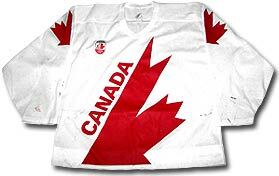 Mike Gartner's Wales Conference jersey worn during the 1993 NHL All-Star Game held in Montreal, Quebec. Gartner collected four goals and was named the game's MVP. 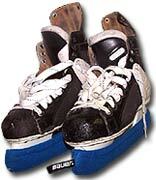 Known for his speed, Mike Gartner wore these skates during the 1992-93 NHL season and as a member of Team Canada at the 1993 World Championships. 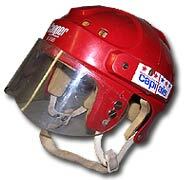 Helmet worn by Mike Gartner as a member of the Washington Capitals during the 1980's. 1975 Wrigley Canadian National Midget Championship. This gold medal was awarded to Mike Gartner as a member of the Barrie Co-op Midgets, the 1975 Wrigley Canadian National Midget Champions. A. Mike Gartner, playing with the New York Rangers during the 1991-92 season, used this stick to score his 500th career goal. B. While playing with the Phoenix Coyotes during the 1997-98 season, Gartner used this stick to score his final goal, the 708th of his illustrious career. C. By scoring his 30th goal of the 1996-97 season using this stick, Mike Gartner established an NHL record for scoring 30 or more goals in 17 consecutive seasons. 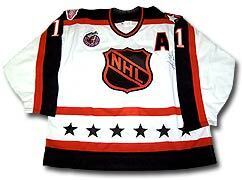 D. On January 1, 1992, Gartner used this stick to register his 1,000th career NHL point. 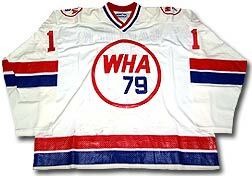 Mike was a member of the New York Rangers at the time.